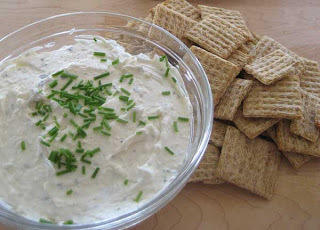 Rachael Ray was not boasting when she named this recipe The Greatest of Garlic and Herb Spreads. I have never, I repeat, never, made this recipe without being asked for a copy of it by at least one person at the party. The stuff just rocks. You can find it in Rachael Ray's Open House Cookbook. This recipe makes 2 cups of the spread, so for a smaller get together I usually make half. If there will be more than about 6 people, I make the whole thing. Now, this recipe probably wouldn't be good for date night, since it will leave your breath pretty darn toxic. Rachael added this comment before the recipe ingredients and I defnitely agree: "Make me a whole day ahead, I taste better that way." It's so easy to make that it won't take much time to do the night before and the payoff is great. Place cream cheese in a bowl. Squeeze lemon juice over it. Add garlic, then, with a hand grater, grate a small onion into a bowl. Add sage and thyme and beat with a hand mixer until creamy and smooth. Chill overnight. [See how easy that was?] Bring back to room temperature to serve. Transfer to serving bowl and top with chives, toasted pine nuts, and cracked black pepper. Surround with lavash or any other variety of flat bread, quartered slices of pumpernickel, or melba toasts [I go with Triscuits]. Mmmm...that does sound like the best spread ever! That sounds so good. I have to make it. I bet it would be good with roasted garlic too.